2012 may have come and gone without the world ending but despite what Idris Elba thinks, the apocalypse has not been cancelled. Several doomsday scenarios will play out on movie screens over the next few months. After Earth will hopefully be a return to form for prodigal auteur M. Night Shyamalan. On the more humorous side, we'll get a disaster-bound pub crawl courtesy of Simon Pegg and Edgar Wright with The World's End and Seth Rogen, James Franco and their actor buddies will offer a meta-humor take on the end of days with This Is the End. Most promisingly, we get Neill Blomkamp's Elysium, a portrait of a grim, socially-divided future and the eagerly awaited follow-up to his epic debut, District 9. 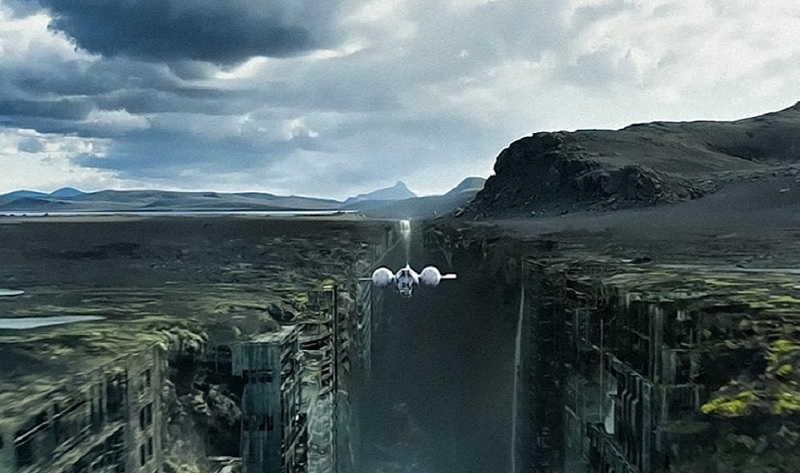 The film opens following a war with an alien race known as the Scavengers that has left Earth a devastated ruin. What remains of humanity lives on a tremendous space station hovering over the horizon, awaiting the chance to migrate to one of Saturn's moons and start again. 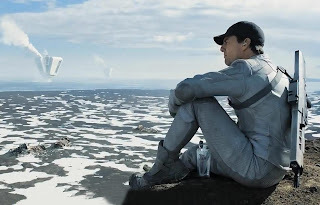 Among the few people left on Earth are Jack and his partner Victoria (Andrea Riseborough), a two-person tech crew there to maintain a fleet of automated drones and protect a cluster of power plants harvesting energy for the journey. With their mission nearing its end, Victoria is eager to join her fellow humans, but Jack is less enthusiastic about abandoning Earth. Despite the fact that he and Victoria have had their memories wiped to protect the details of their mission from the enemy, he is prone to nostalgia regarding his home planet as it was and has frequent visions of a life before the war alongside a beautiful woman (Olga Kuryenko). His confusion deepens when that same woman appears in his patrol area in the form of Julia, the lone survivor of a NASA mission that vanished years before. He also encounters a group of human survivors still residing on the supposedly evacuated surface who inspire questions about his mission and fuel his determination to help them take back the planet. 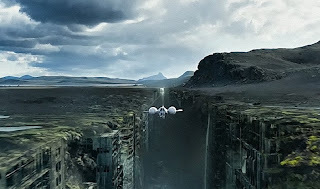 The initial set-up contains clear strains of many other science fiction films of the past few decades: the lonely assignment of Moon, the devastated Earthscape of Wall-E, and questions of memory and reality that bring to mind Total Recall. This familiarity isn't a fatal problem in itself, particularly since science fiction films and literature are constantly borrowing from their history to build upon. Also, to be fair, Kosinski devised the plot for the film years earlier for an unreleased graphic novel. Anyway, if Oblivion settled for using bits of other works as a framework for a routine action-adventure, this would be a minor issue. Unfortunately the whole story hinges on a big revelation that will also be extremely familiar to anyone with a passing interest in the genre. I'm trying to be careful here since mentioning other films that the big twist borrows from could serve as a spoiler to those films as well and frankly those movies do the ideas in question better service than Kosinski has. It doesn't help that the script has to do a ton of narrative gymnastics to keep the truth concealed from both Jack and the audience, with characters acting inconsistently and performing actions that make little practical sense beyond protecting a big secret that on reflection doesn't make a heck of a lot of sense. Not since Michael Douglas was left stumbling his way through The Game has so much effort gone into keeping a protagonist in the dark. I'll confess there's a temptation, considering the amount of talk in the film about drones and using up natural resources, to read a political allegory into the story, but the aforementioned revelations make that impractical. In fact, they prevent much of any real subtext to the story, beyond an ironic and no doubt unintentional one which I will speak on in the SPOILER section at the bottom. 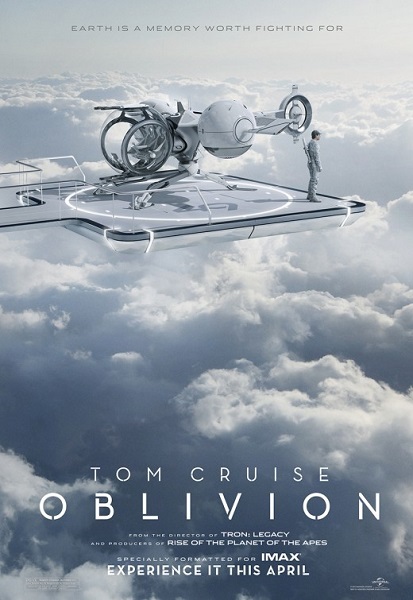 Oblivion's strongest asset is the considerable atmosphere Kosinski is able to build. The sleek lines and gleaming surfaces of Jack and Victoria's sky-high base, vehicles and technology are contrasted with the rugged beauty of the desolated Manhattan, smashed into canyons and plateaus and slowly being reclaimed by nature. Action sequences and chases involving Jack's lithe flyer are suitably exciting and the drones, complete with the requisite big red eye that has denoted sinister machines since HAL 9000, are effectively menacing. The soundscape is just as compelling, from the mechanical beeps and tones of the machinery to M83's score, which evokes the synthesized futurism of 80s sci-fi like Blade Runner. The only notable production drawback is the Scavengers themselves, who appear to be wearing cut-rate Predator armor. The film's strongest in its first quarter, which almost feels like a fictitious version of Life After People. There's an archaeological thrill to be had watching Jack speed around the few remaining New York landmarks, investigating mementos of a lost past, but it is a detached thrill. We never feel the weight of the destruction or the tragedy of the human lives lost. Perhaps it's because Jack never seems to feel it. He's content to reminisce about historic ball games and collect knick-knacks for the cabin hideaway he's constructed for himself, but as a heroic figure he's sadly lacking. Once the facts begin to fall into place for him, there's little inner conflict to his choices or drive in his motivation to fight back. Even the event that reveals the truth about the situation doesn't come from him actively seeking the answer out but as the result of an accident. These are not good qualities for a hero that everyone in the film seems dubiously interested in and on whom the fate of humanity seems destined to fall. That said, one can't fault Tom Cruise, possibly one of the last old-style movie stars Hollywood has left. Whatever you can say about his offscreen activities or persona, there's no denying the man can still bring in audiences and gives each role his full intensity and commitment, even if he doesn't seem as interested in stretching himself dramatically here. What little charge the character possess comes almost entirely from his efforts. Sadly, it isn't enough. As Victoria, Riseborough's role seems at first to be a bit more interesting. When interacting with the pair's supervisor (Melissa Leo, making her best attempt at a Mission Control twang), she is constantly giving assurances that she and Jack are an effective team, a phrasing that she seems to interpret beyond their working relationship. Bereft of other people and even their memories, they seem to have settled into an almost pseudo-romance by default, a situation that's disrupted by Julia's arrival. It's to Riseborough's credit that we almost don't realize just how ill-defined a character Victoria is beyond her relationship with Jack. On the other hand, Kuryenko, despite being stunningly beautiful, lacks the gravitas to keep us interested in the mystery Julia represents and can't smooth over some of the character's erratic behavior. 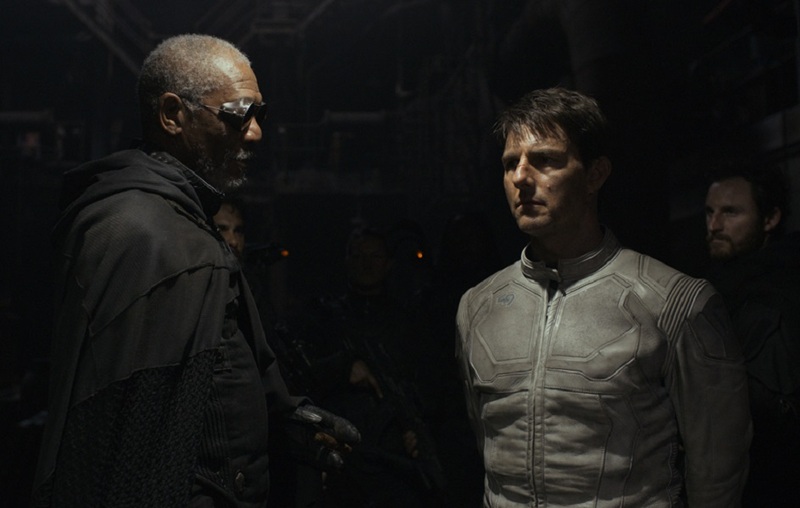 Although Cruise is giving his all, that is sadly not the case with Morgan Freeman. As Beech, the leader of the human resistance, he looks costumed to out Morphesize Laurence Fishburne but barely seems interested in the struggle his people face. Freeman seems to be hitting that dangerous career phase that many great veteran actors face, in which they are cast in parts that correspond with or are tailored to their screen persona, a move that can result in both bored actors and bored audiences. Nikolaj Coster-Waldau, best known as Jaime Lannister on Game of Thrones, doesn't seem to have much to do but scowl at Cruise suspiciously and fire off a few rounds with his rifle, but at least he does it with conviction. It's still more than Zoe Bell gets. Six years after she revealed what a delightful screen presence she can be during the Tarantino segment of Grindhouse, Hollywood still can't figure out what to do with her. Here her role consists of standing over Freeman's left shoulder with a big gun and grunting here and there as things blow up around her. Someone get this woman into a superhero film! In the future, I regretfully suggest that Kosinski might find greater success if he were to allow other, better writers to construct the story while he focuses on what he does best: creating a gorgeous world for that story to play out in. He certainly manages that for Oblivion: the downfall of humanity hasn't looked this scenic in a long time. It's just a shame that as depicted here, the world isn't in danger of ending with a bang or a whimper, but an echo of what's come before. Ok, so Jack and Julia eventually crash land in the 'forbidden zone,' an area outside his patrol area that is supposedly bathed in deadly radiation. Upon getting out of his ship, he not only finds that he's still alive but sees a familiar figure servicing one of the drones. As he approaches, the audience's worst fears are realized... yes, it's another Jack and our hero is a clone. The reveal that Jack's superiors are not in fact human but is actually a mechanical invader force us to consider what a really convoluted scenario this would have to be to work. Despite having a force of highly durable mechanical drones, the invader, known as the Tet, chose to produce what appear to be thousands of clones of Jack and Victoria (who were captured during Julia's NASA mission) to invade the Earth. Beech suggests the invasion clones of Jack were programmed to be merciless killers, but if the Tet can do that, why bother with keeping up the whole charade for Jack and Victoria? Beech also comments that his people dress in their 'Scavenger' gear to fool the drones, but that seems rather unnecessary as well. Wouldn't camouflage be better, and even if not, why do they bother running around on all fours when the drones aren't around? Not the most practical combat stance for a human. There's also Julia's actions. It doesn't seem logical that when she's first discovered by Jack and is helped by he and Victoria, whom she should also recognize from their space mission, she doesn't bother to try to convince them of who they really are or what happened. Moreover, her reaction to discovering what Jack is all over the map. First she screams at him not to touch her, but before long she accepts this replica of her presumably deceased husband without too much protest. Hell, by the end, she seems content to shack up with the other Jack that's been discovered, as though they are all interchangeable. If there are more out there that seek her out, Julia may find she had her hands full, although a contingent of Tom Cruises could no doubt come in handy for the upkeep of her deluxe new cabin. 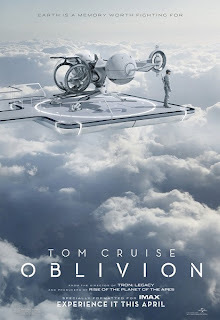 There is a strange irony of having a film that mimics so many other films turn out to be about a clone in itself, but unfortunately just like Jack, Oblivion makes no effort to reconcile its identity crisis or even assert itself as unique in any way. It simply follows the instincts and perceived intentions of the original. But make no mistake, this clone is in no way a substitute for its predecessors.